Chances are if you’re thinking about buying or selling a practice, you would have done a little ‘Google research’ beforehand, which makes complete sense, as with Google you will get a national as well as a local perspective. When choosing which agent to use you would be similarly prudent to chose one with both local knowledge and national coverage, as they will have access to more potential buyers/sellers than a regional outfit. 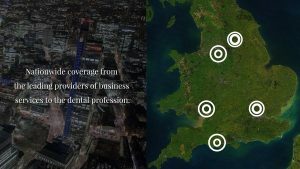 We’ve been established for 30 years and have offices in numerous locations across England and Wales to support our clients wherever they reside. Frank Taylor & Associates has also signed up to the voluntary code of practice for dental agents, the ‘Practice Sales Promise’. This code sets minimum standards to expect from your agent, which will make the process of buying/selling more straightforward and transparent – no hidden fees, terms agreed prior to engagement etc.